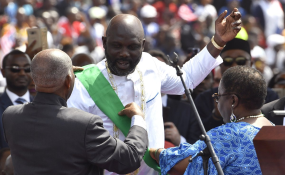 Liberia President George Weah (file photo). President Ellen Johnson-Sirleaf Tuesday delivered her final message as president of Liberia indicating that Liberia's democracy is irrevocable. In a live nationwide address, President Johnson-Sirleaf said the democracy that Liberia currently enjoys binds every future to the will of the people. She said "Liberia today reflects the changing face of the Continent where rule of law, human rights, good governance, and accountability are demanded by its citizens. This is Africa's future. And Liberia is one of its enviable democracies." The Liberian leader recalled that in 2006, "many doubted us -nor certain if Liberia's democratic resurgence would last. That our new found peace would hold. And yet, look around you; two peaceful and credible successive national elections, and now, an historic transfer of power from one elected leader to another." She recalled the heavy burden her government inherited, and the painful past, which "we carried together, were no match for her dear friends. Never did you loose hope in yourselves, pride in our nation, or the determination to persevere." Continuing, the president said "it was your energy that lifted her up each day; motivated her; gave us the drive to exhaust all possibilities for the benefit of our beloved Liberia; As I speak my last words to you as president, they are simply to say-- Thank You for the honor to serve." The outgoing President told the nation that the world has changed a great over the past decade with governments and nations turning inward, in search of resolutions to their domestic challenges. "For a country like Liberia, this means that we need to be more self-reliant. Each of us has to take on more responsibility for the development of our country," she stressed. Reflecting on the just ended elections, she noted: "We had a contentious, highly-charged political year. I know that. But now, we must put the disunity behind us; Liberian has but one president, and one government. We must dedicate ourselves to ensuring its success; my parting wish is that you will support your new government. Respond to its call for action, and civility; and hold it accountable." The president called on Liberians to cherish Liberia's democracy, participate in it, respect and support its institutions, work together to address the challenges, and take pride in the success. She thanked Liberia's international partners including donors, investors, NGO workers, humanitarians and friends. The president said she was leaving the presidency in awe of their generosity in a world with so many great needs, they chose Liberia, noting "we have learned and innovated together, and these gains will go on to benefit our next generation." "We bow are heads to our sisterly African nation, particularly those in West Africa, who granted us refuge during our days or turmoil, helped us to regain our peace, and supported us in the path towards democracy; We can now boast of unprecedented regional solidarity; I wish to recognize Liberia's historic and essential partner, the government and the people of the United States of America; you have been with us through our historic journey; and stood by us in our difficult moments; There are many other bilateral partners - China, Germany, Japan, Norway, Sweden, Kuwait and the United Kingdom, to name a few. Please know that Liberia's success is also shared by you," she underscored," she noted. She thanked members of civil society, judiciary, the media, religious and traditional leaders for their support over the years. The president said she was leaving behind functioning institutions, a plan of transition, and trained professionals, adding that the foundation has been laid for the next administration.